I’m currently in Vancouver, spending a few extra days in the city after attending the 2017 Society for American Archaeology meetings. At the moment I’ve been waylaid by a merciless head cold, but you don’t have to be at the top of your game to appreciate how beautiful this city is. As if this view wasn’t enough, I snapped this photo on my way to dim sum. DIM SUM! As is my wont, I’ve spent my free time in the city immersing myself in the local culture (eating), catching up with old friends (eating), making professional connections (eating), and taking a few moments to stop at the conference center overlook and ruminate upon the majestic mountains (while eating). On the last day of the conference, I was also able to find the time to visit the UBC Museum of Anthropology, which has a reputation for being one of the best anthropological museums in the world. It did not disappoint. However, despite all of my gallivanting about the city (eating), I was actually in town for professional reasons. I presented a paper on March 30, in a Thursday evening symposium titled “Manipulated Bodies: Investigating Postmortem Interactions with Human Remains.” My paper focused on evidence for the postmortem manipulation of human remains in Late Prehistoric Iberia, touching upon the Late Neolithic–Copper Age sites of Bolores and Perdigões in Portugal, and the Copper Age site of Marroquíes Bajos in Spain. The session was organized by Elizabeth Craig-Atkins, senior lecturer in archaeology at the University of Sheffield. The papers were geographically chronologically wide-ranging: we moved from the British Neolithic to the Iberian Copper Age, followed by the British Bronze Age, Roman Iron Age, early Anglo Saxon period and medieval period, and closed with discussions of historical Romania, contemporary Britain, and Hong Kong. It was nothing if not an eclectic mix of papers. Despite the diversity represented within these case studies, a number of overarching themes tied the session together. Many of the Late Prehistoric through Medieval papers touched upon communities’ frequent interaction with the dead, the selection of specific elements or individuals for burial, the movement of bones across and between mortuary spaces, the blurring of initial ritual context over time, and the repeated use of mortuary spaces, even over periods separated by hundreds of years. The historical and contemporary presentations demonstrated radical shifts in mortuary practices over the course of even one or two generations, particularly in tandem with larger changes in global economies, migration patterns, or political regimes. Being a prehistory snob, I was surprised at the degree to which some of the papers on more recent societies resonated with things I had been thinking about in the context of my own research. For example, Steven Gallagher, who is a law professor at the Chinese University in Hong Kong, gave a presentation on secondary burial practices among the Chinese diaspora. In Hong Kong, secondary burial practices continue to this day, even in the face of tightly controlled regulations, underscoring the continuing importance of forms of forms of mortuary practice we often unthinkingly relegate to the prehistoric sphere. Similarly, the “Continuing Bonds” project introduced by Lindsay Büster uses archaeological case studies to facilitate discussions of death, dying, and bereavement between health care professionals and patients. This kind of work makes it clear that a modern Anglo-American perspective, where death is a taboo that is tightly spatially and temporally constrained, is insufficient for understanding the complex web of interactions between the living and the dead in the past. Our discussant was Anna Osterholtz of Mississippi State University. In her discussion, she emphasized a series of intertwined themes that were woven throughout the papers in this session, including materiality and immateriality, as well as space and place. I found the latter two a particularly compelling pair to think about. Many of the presentations, diverse as they were, resonated because I’ve recently been reading a lot of literature emphasizing the re-use of mortuary spaces at points in time quite distant from their initial construction. Within our session, Elizabeth Craig-Atkins and Dawn Hadley‘s papers on the Rothwell Charnel Chapel emphasized that three out of five recent radiocarbon dates fell between 1250 and 1450 AD, when archaeologists had anticipated that the chapel would have been used. However, surprisingly, the remaining two dates were from the 18th and 19th centuries, several hundred years later. 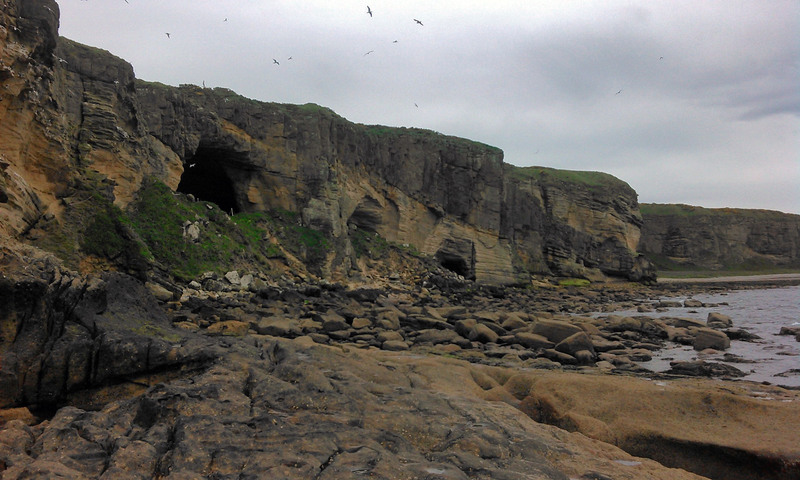 Similarly, Ian Armit, of the University of Bradford, described the mortuary assemblages in the Covesea Caves of Northeast Scotland, which contained both Early Bronze Age (c. 2500-1500 BC) and Roman Iron Age human remains, from nearly a millennium later. In my own presentation, I referenced a Copper Age mortuary area at the site of Marroquíes Bajos that shows Early Bronze Age reuse, several hundred years after the initial funerary depositions were made. I also described the site of Bolores, a Late Neolithic – Early Copper Age artificial rock shelter where ten burials have been dated to 2800-2600 BC…but an eleventh interment was dated to 1800 BC, nearly one thousand years later. My collaborator Colin Quinn has noted a similar pattern in the radiocarbon dates at the Bronze Age Mound of the Hostages in Tara, Ireland, where a single burial was interred in the mound several hundred years after all other mortuary activity had ceased. Probably a fair bit of mnemonic density kicking about here. All of this suggests that we as archaeologists need to be particularly attuned to the potential of mortuary sites to experience multiple periods of use and re-use in prehistory. In my own presentation, I referenced a term that archaeologist Katina Lillios has used to describe mortuary spaces in Late Prehistoric Iberia. She refers to a quality called mnemonic density, “the potency of spaces or things resulting from their repeated use over long periods of time and their accumulated…memories, associations, and meanings” (2014: 8). Though at first glance quite eclectic, the papers in the “Manipulated Bodies” session underscored the extent to which the re-use of mortuary space was an important element of many different kinds of prehistoric mortuary rituals, and that this attention to the mnemonic density of burial spaces was likely a recurring feature of prehistoric mortuary rituals in Europe. The session has certainly given me many things to consider in my research going forward, which I suppose is the point of conferences (besides eating). Image Credits: Continuing Bonds header from Continuing Bonds project website, here. Photograph of Rothwell Church from University of Sheffield, here. Covesea Caves photo from Society of Antiquaries of Scotland, here. Photo of Stonehenge from English Heritage, here. Lillios, Katina T. 2015. Practice, Process, and Social Change in Third Millennium BC Europe: A View from the Sizandro Valley, Portugal. European Journal of Archaeology 18(2): 245-258. This entry was posted in Bioarchaeology, Conferences, Travel and tagged #SAA2017, archaeology, bioarchaeology, secondary burial, Vancouver. Bookmark the permalink. Thanks for the great write up Jess – your paper was an excellent addition to the session and I’m glad the other papers also provided food for thought! Thanks for organizing the session Lizzy! Definitely got my mind going.